MC or Modern Combat is one of the best shooting games available on android. It has generated millions of game fans worldwide. You can crate a squad and go into the intense battlefield, add friends in multiplayer warfare against online rivals from around the world or you can play offline and also choose to go solo and shoot your way through enemy lines to save the world from anarchy. 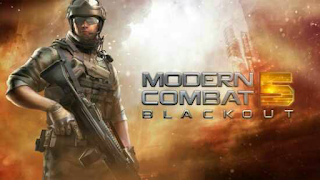 What’s New In Modern Combat 5? • New game mode added: Rush – The most strategic game mode yet: fast-paced, round-based, amazing power-ups! √ VULCAN ARMOR: The new Sapper armor. √ SHIBING ARMOR: A traditional Chinese-themed armor. • Weapon rental: Diamond Dust is used to try out weapons that has not been bought. • Unzip or Extract the Obb data file folder using any of the android file extractor downloaded above to any folder on your SD Card. • Now you can install the Modern Combat 5 apk file or Mod apk file (your choice) downloaded above. • Enjoy MC5 on your android device ! Modern Combat 5 is one HD game that is fun and addictive, enjoy the graphic and gameplay. If you encounter any problem on the installation, let us know via the comment box below and you will be assisted.